Synchronization is usually related to cloud storage services such as OneDrive or Dropbox, but you can also sync your files locally. 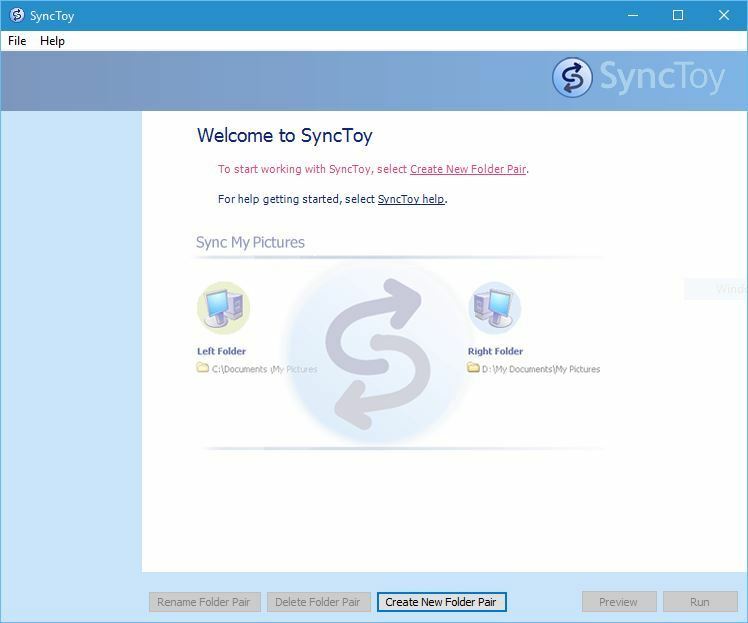 Microsoft released its own syncing tool called SyncToy, and today we’re going to show you how to download and install this tool on Windows 10. 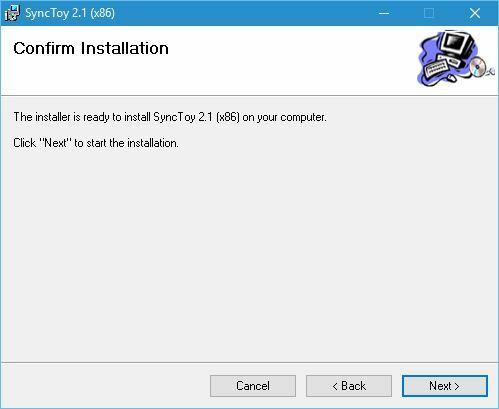 How to install Microsoft SyncToy on Windows 10? 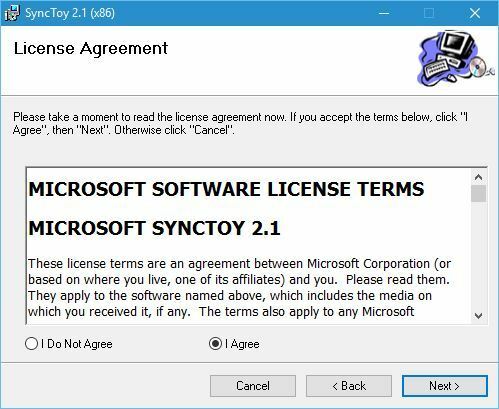 SyncToy is a freeware syncing application from Microsoft, and it was a part of PowerToys series. This application is written using Microsoft’s .NET framework and it utilizes Microsoft Sync Framework. 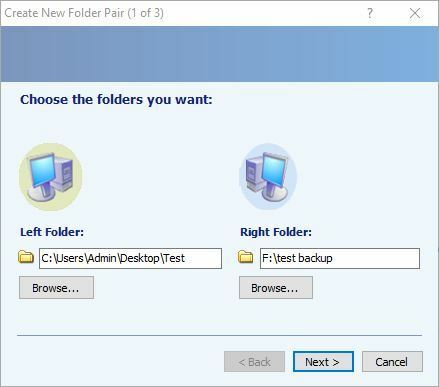 In order to use this tool, users have to select a left folder that works as a source and a right folder that works as a destination. Great thing about this application is that you can choose any folder to be your destination or source folder. You’re not limited to your internal hard drive, therefore you can choose a folder on a portable hard drive, USB flash drive or even a network drive. Select the version you wish to download. 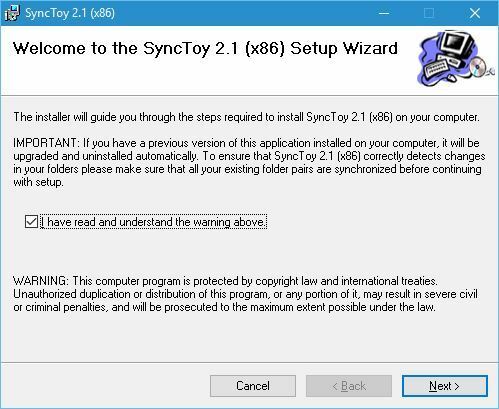 If you use 32-bit version of Windows 10 select the x86 version, but if you use 64-bit Windows, be sure to select 64-bit version of SyncToy. Click the Next button to start the download. Once the download is completed, locate the file you just download and double click it to start the setup. 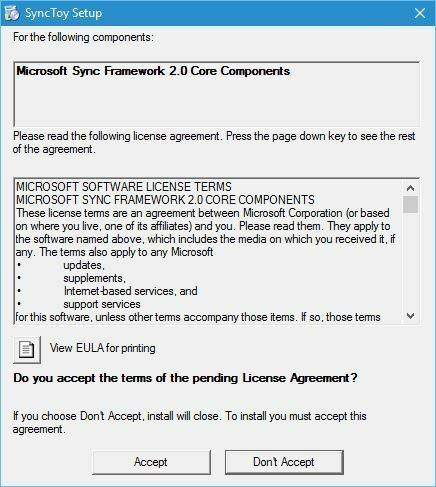 First thing you’ll notice is the Microsoft Sync Framework 2.0 Core Components agreement. Read it, and click the Accept button. Wait until setup installs Microsoft Sync Components. Setup will now give you a warning message. Read it, check I have read and understand the warning above and click the Next button. Now you’ll see License agreement. Read it, select the I Agree option and click the Next button. 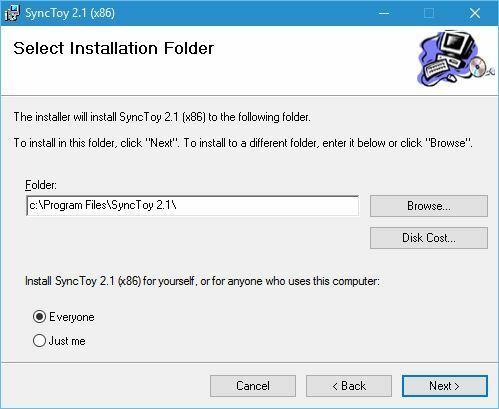 Select the destination directory where you want to install SyncToy. If you want, you can install the application just for the current user or for all users on this computer. Once you’re done, click the Next button. 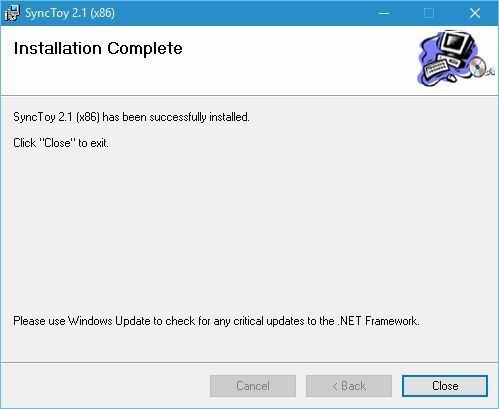 Click Next button once again to start the installation process. Once the setup is completed click the Close button. After the SyncToy is installed, you can start it by double clicking the SyncToy 2.1 shortcut. When the application starts click the Create New Folder Pair. Now you need to select left folder and right folder. Click Browse and select the two folders that you want to synchronize. After you’re done click the Next button. 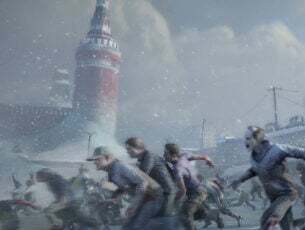 Now you need to select which method of synchronization you want to use. There are three methods available: Synchronize, Echo and Contribute. 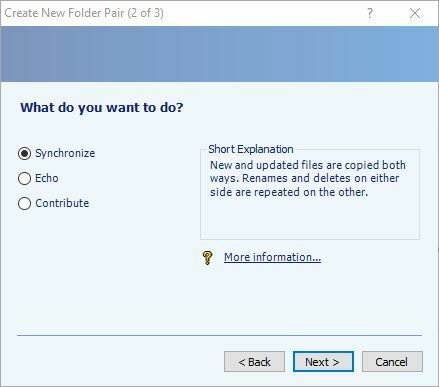 Synchronize option will synchronize any new, deleted or renamed files. This means that if you delete or rename any file in either of the two folders, the changes will be performed to the second folder as well. Second option is Echo, and it works similarly as the previous option but with one difference. While using this option changes are only applied from the left to the right folder. This means that if you make any changes in the right folder, they won’t be applied to the left folder. Last option is called Contribute, and it’s the safest option to use. This option allows you to rename files in the left folder in order to update the right folder. Changes in the right folder won’t affect the left folder at all. It’s also important to mention that this option doesn’t allow deleting, so even if you delete a file in the left folder, that folder won’t be deleted in the right folder. After you’ve selected the option that works best for you click the Next button. 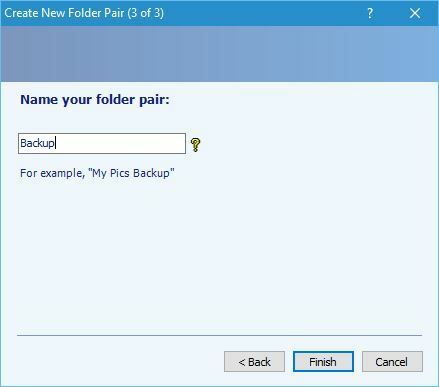 Enter the name of the folder pair and click the Finish button. After creating the folder pair, you can see its properties. If you want, you can change the Synchronization settings at any time and you can even exclude certain files from synchronization. Synchronizing folders is simple, and to do that just click the Run button. After the syncing process is completed you’ll see a detailed report. Bear in mind that you can have as many folder pairs as you like, and you can sync them all with just a single click, or you can sync them individually. To make sure that you don’t accidentally delete your files, there’s a option to preview changes before you sync your files. In addition, you can turn on the option to move all deleted files to Recycle Bin in order to avoid deleting the files permanently by accident. 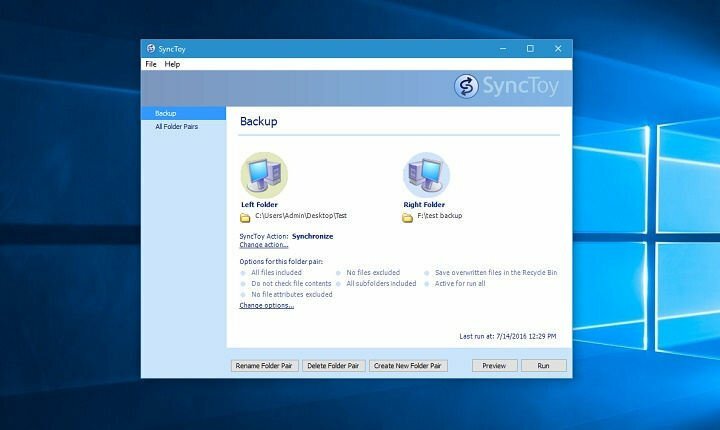 SyncToy is a great tool for backing up your files, and if you want you can even schedule a backup. 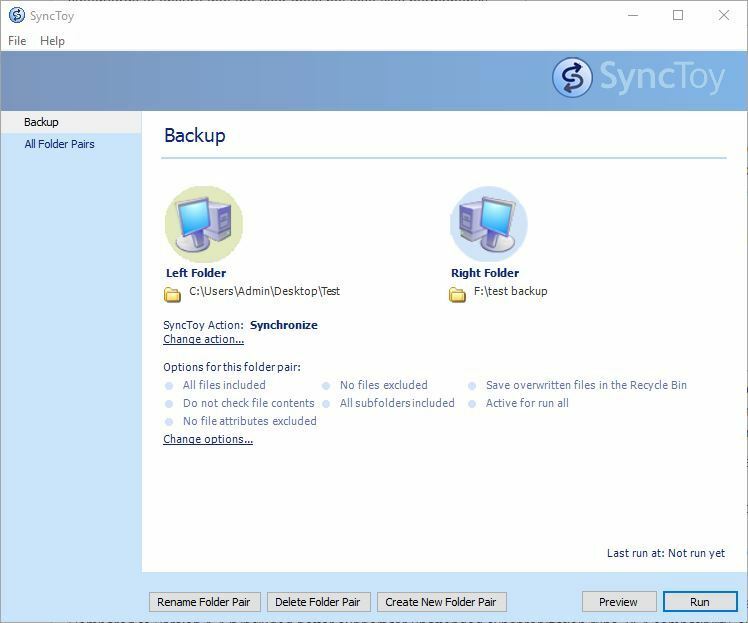 To see how to schedule a backup in SyncToy we suggest that you check the help manual for detailed instructions. 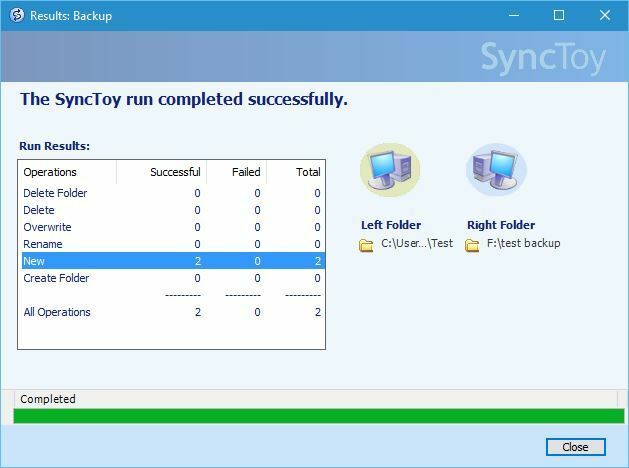 SyncToy might not have some advanced features that other applications have, but we have to say that SyncToy works flawlessly on Windows 10. If you used this application in previous versions of Windows, you’ll be happy to know that you can continue using it on Windows 10 as well.